We recognise that not everyone chooses to eat meat. Even those who do may not actually make a choice when they eat it; they may eat meat because they’ve always done, and not really have thought about it before. From chatting to our customers at food shows and tastings, even down here in Devon, we realise that not everyone is confident about where to access reliable and fact-checked information about the origins of their meat. As we have two vets, a dairy farmer, a retired food science lecturer and a dietitian in the family, we realise that we might be considered a bit obsessed with our food and where it comes from! 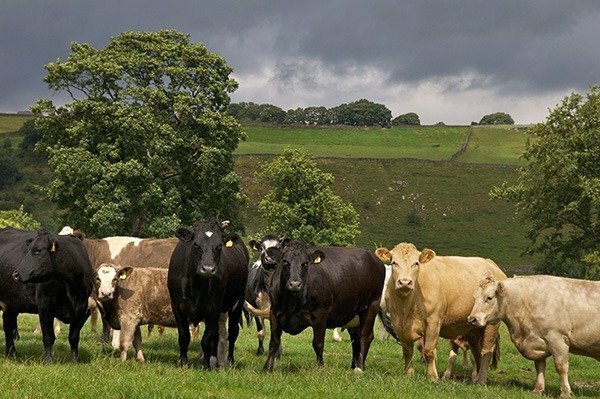 So during Great British Beef Week 2019, we hope to give a brief overview of how cattle are reared for beef in the UK, and help you consciously choose to select the best beef you can within your budget. By checking for a few key details, you can choose assured British beef which has been born, bred and raised according to high health and welfare standards, supporting conservation, sustainability and the local rural economy. Not everyone can afford to shop routinely at the local farm shop (nor can we), not everyone has a local farm shop; but even on a tight budget, if you’re buying beef, you can still buy it well. Talk to your butcher – they will often have a provenance board telling you how nearby the farms they use are. Their local knowledge may be able to tell you if the animal was reared and finished there or not, and what quality assurance the farm might adhere to. You might also be surprised to know that they aren’t always the most expensive option. Extensively grazed, slow grown beef often comes from land which is unsuitable for agricultural purposes other than grazing. The cattle are an important part of that ecosystem, and many farmers are involved in conservation schemes to sustain and protect local landscape. Choosing to buy this type of meat when you can helps support their efforts. Be aware that some supermarkets only supply British beef; and although they may exert greater buying pressures on farmers, you can still support British farming by buying here. Consider buying a bit less meat, but meat with better welfare, provenance, sustainability and quality standards. Grass + cow = beef? Well, kind of. Traditionally in the UK, and we’re going back a bit here, farms were generally small affairs, supporting one or a few families. 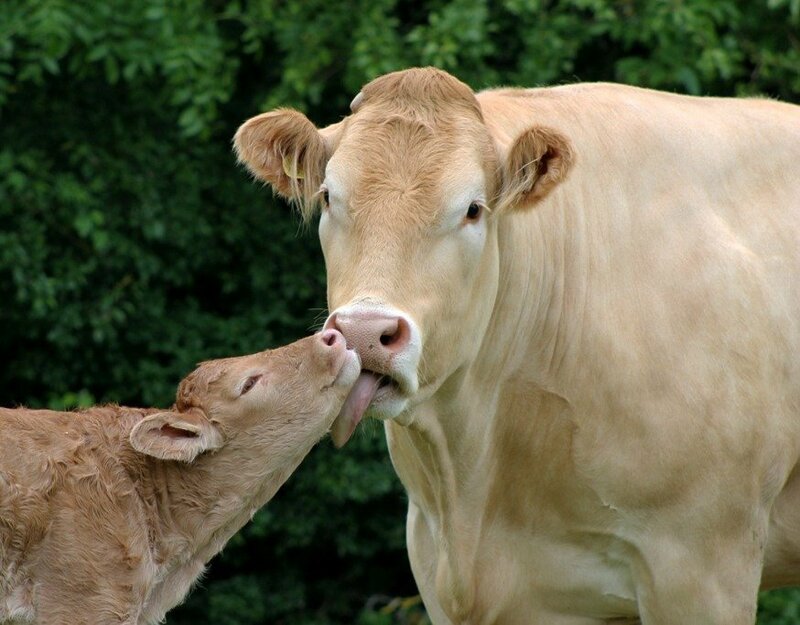 Cows (technically female cattle who have had more than one calf) were usually ‘dual-purpose’, i.e. they would have a calf and produce milk to feed that calf and supply the family. The calf could be reared for pulling a plough or for its meat, or if female, to take over the cow’s role when she got too old. The harsh realities of life would mean that when the cow got too old, she might be “sent on” to the local abattoir and her meat used to feed the family. Older cattle don’t produce the most tender, succulent meat, but traditionally the ethos of waste not, want not was strong, and a use would be found for every part of the cow’s carcass. Male cattle are preferred for beef production because testosterone means more muscle, so more meat. These days, cattle tend to fall into two types – beef or dairy, although there are still breeds which are dual-purpose, and still parts of the world where this type of cow is essential. Dairy breeds are those selected for their genetic ability to produce milk; either lots of it, or milk which has certain quality, such as a high butterfat content of the Jersey cow. Traditional native UK dairy breeds include the red and white Ayrshire and the Shorthorn. Today in the UK, dairy cattle are largely the black and white cows that you see in fields or on milk cartons and advertisements. The most popular modern dairy breed in the UK is the Holstein Friesian, which produce high volumes of milk. Beef breeds have been selected for their genetic ability to produce muscle, which is the meat we eat. Certain breeds are also selected because of the lean meat they produce, and others because they produce a particular amount and distribution of fat through their muscle, known as marbling and valued because of the particular flavour it can impart. There are traditional British beef breeds such as the beautiful black Aberdeen Angus from Scotland, and the Hereford with their lovely white faces; and the “continental” beef breed, such as the Charolais and Limousin, both native French breeds. However, any of these breeds can be born and raised or reared in the UK, and be classed as British Beef regardless of where the breed originated from way back in the past. previously transported abroad to be raised as veal. Beef breeds + grass = muscle = beef? Beef breeds can actually be raised in a number of different systems in the UK. One animal might stay on one farm for its life, or more usually it might experience different rearing methods and farms throughout its life. Growing – a period of continuous growth, where the aim is to grow the animal’s frame/skeleton. Fattening/finishing – often in specialised finishing units where the aim is to maximise “liveweight gain”, effectively growing muscle. This can take place as early as 6-7 months (for veal) or by 16 months as bull beef (entire males) or finished slowly and slaughtered at 18-24 months or so as steers (castrated males). Bulls are generally more efficient at gaining muscle and producing leaner meat, but they require specialised handling and more costly facilities, and can be pretty risky work. Ferdinand, they are not! Steers are generally better suited to more extensive systems. Cattle in these systems spend most of their time in fields, although they may have to be housed for part of the winter. We have a temperate climate here in the UK, and in my book, it’s hard to beat the bucolic image of cattle eating grass in a field in the sunshine. However, it’s often not possible and indeed would be considered poor management and potentially cruel to keep cattle out all year round, when fields turn to mud. Cattle in these systems may be housed throughout all/most of their lives and fed straw and concentrates (a nutritionally balanced, pelleted feed designed for different stages to help encourage growth, and build muscle), or preserved grass (silage) and concentrates. Although used in the United States, feedlot-style systems are currently uncommon in the UK, due to our weather and less available space. Feedlots can be barren ground where the cattle are outside in enclosures for part of the year, and fed in a similar manner to the intensive, indoor systems. A study reported in 2018 by the Guardian and the Bureau of Investigative Journalism showed “nearly a dozen” of these intensive beef units operating across England; mostly in the east, and that their evidence suggested “that most intensive beef farms appear to operate to high welfare standards”. Current EU law defines veal as meat from calves of less than 8 months old. Meat from calves between 8-12mo used to be called “young beef”, but is now legally known as beef. Veal often gets a bad press, although Compassion in World Farming states, “When produced under the best conditions, veal does not need to be a cruel meal”9 when produced in the UK as rosé veal (technically beef!). Veal crates, in which calves could not turn around, were banned in the UK in 1990 and in the EU in 2007. Calves in the UK-based veal production units must have more space than dictated by EU regulation, receive the EU minimum iron content and have double the amount of fibre in their diet, and slaughtered between 8-12 months old. This makes their meat a pinker colour, hence the term rosé veal. There is not a huge demand for this meat in the UK, hence the proportion of calves raised this way is lower. Rosé veal produced elsewhere in the EU can be produced to lower welfare standards, but can also come from suckler herds, where calves are kept with their mothers in higher welfare systems, in both the UK and the EU. Currently, calves cannot be transported from GB direct to the continent for to be raised for veal or meat. P&O ferries will only carry breeding and milking livestock on their cargo ferries, and then only on the shortest crossing which is Dover-Calais. The National Beef Association is a membership body which describes itself as “the only dedicated voice for British Beef Farmers” which promotes and supports the UK beef industry. It has undertaken the responsibility for ensuring that livestock meet these criteria and booking the crossings through their head office. 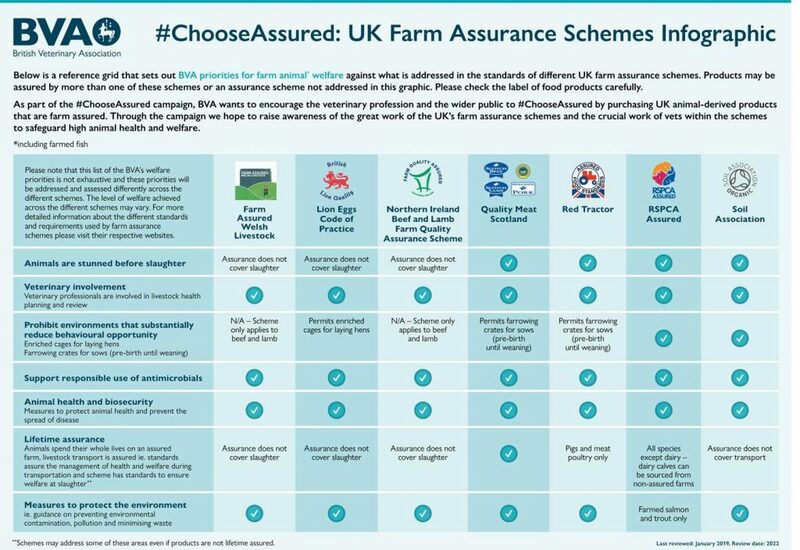 There are a number of voluntary farm assurance schemes in the UK. 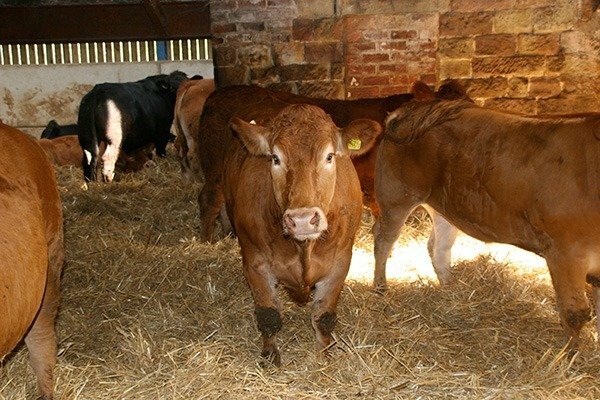 The British Veterinary Association (BVA) considers that these provide producers with a way “to demonstrate that they comply with specific and independently certified standards at each stage of the supply chain from ‘farm to fork’. These standards include, but are not limited to, animal health and welfare, food safety, stockmanship training and competencies and environmental protection”, higher than the standards required by law. Vets have helped to set up and evaluate these schemes, and guide farmers in creating herd health plans and compliance with them. The BVA uses seven guiding principles to help you assess how some different schemes each assess their priorities for animal health and welfare, as shown in their infographic. Please note that not all schemes are included here. 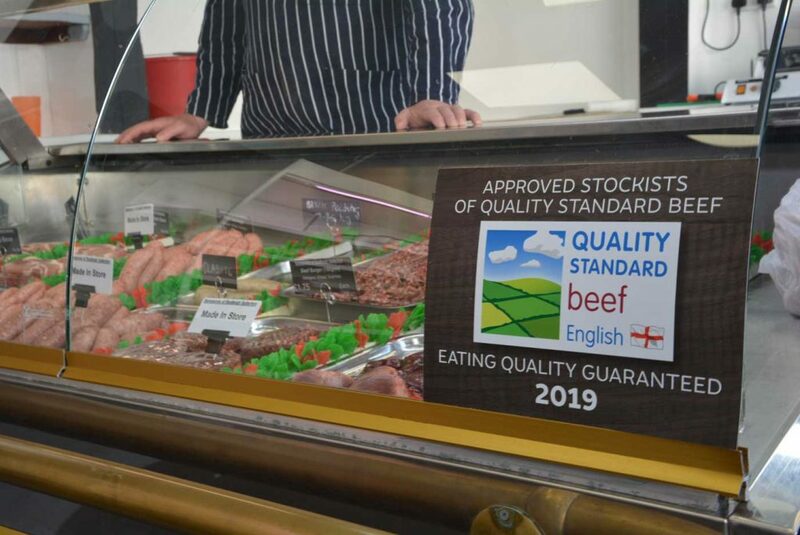 The only assurance scheme currently which covers eating quality is the Quality Standard Mark for Beef and Lamb, with a selection process which restricts older and breeding animals from eligibility, and is so designed to include succulence and tenderness. This is likely to make it attractive for chefs and keen home cooks alike, particularly if you are looking for more detail on provenance. The QSM can identify beef from cattle born, raised and slaughtered in England, by carrying the St. George’s flag; or if it carries the Union flag, it indicates British beef. A QSM with an EU flag is used if the animal spent its life in more than one EU member state. 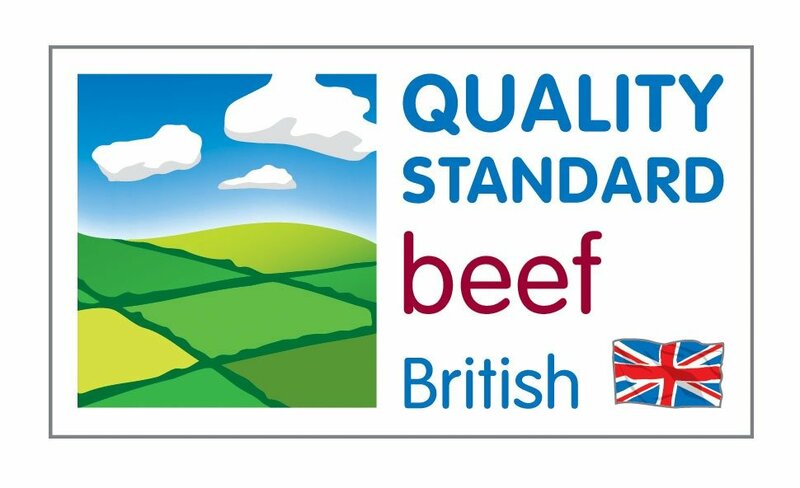 The Red Tractor scheme sits alongside the QSM scheme16 and is widely recognised farm assurance scheme, and inclusion of the Union flag means that the food or drink has been born, grown, packed and transported all in the UK; indicating British Beef. RSPCA Assured scheme is the RSPCA’s animal welfare farm assurance scheme and has replaced RSPCA Freedom Food. Yes, we’re biased, but we know that the West Country is special for all sorts of reasons. 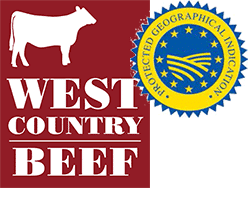 In January 2014 another reason was added to that long list when Protected Geographical Indications (PGIs) for West Country beef and West Country lamb were recognised by the European Commission. 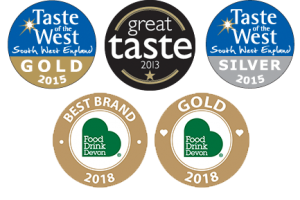 This means that beef and lamb from Devon, Cornwall, Somerset, Dorset, Gloucestershire and Wiltshire which meets strict standards for specific criteria, is eligible to carry the PGI logo and be labelled as ‘West Country’. To meet the requirements, cattle and sheep must be reared on a minimum 70% forage diet on farms in the West Country region. Our unique grazing and climate gives the end product a tangible difference in taste – and also increased levels of Omega 3 and vitamin E.
Ladies in Beef have also produced the free, quick and illustrated A Shopper’s Guide to Buying British Beef to lead you through the labyrinth of food labels – particularly when buying processed beef products such as pies20. Buying British (or EU) meat? Then that’s just not true. The use of hormones as growth promoters has been banned in the UK and EU with legislation in 1981 (implemented in 1989), and antibiotics as growth promoters since January 2006. Hormones and antibiotics may be prescribed by a vet as medicines to treat disease as an essential part of animal welfare. There are very strict controls on avoiding drugs entering the food chain, and severe penalties if they do. In other parts of the world, hormones and antibiotics may be used as growth promoters. It all kicked off a bit when the EU banned the import of hormone-treated beef since 1989 due to fears that certain hormones may be carcinogens. The scientific evidence has subsequently been disputed, and the legal decisions have been challenged. In the current political climate, this issue is somewhat resurgent. If in doubt; buy local, buy British. So, how do we choose welfare friendly, environmentally friendly, local beef? Read the Past-President of the BVA’s thoughts on the #ChooseAssured campaign here. Butchers will often have a provenance board telling you how far away the farms they use are. Their local knowledge may be able to tell you if the animal was reared and finished there or not, and what quality assurance the farm might adhere to. You might also be surprised to know that they aren’t always the most expensive option. 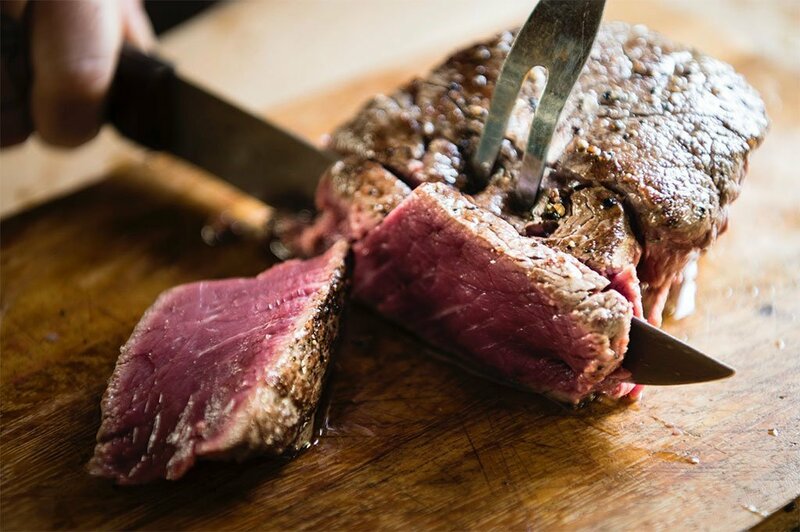 To help you make the most of the beef you cook, here are some links to recipes you can enjoy through Great British Beef Week 2019. See the next part of our blog series where we talk with Brian Sampson’s Butchers, Budleigh Salterton, Devon.